My subscription copy of FLASH turned up one day, finally revealing to me what was going to happen in the wake of the Top’s final post-demise plan last issue. But first off, boy, that’s an unattractive cover. Again, the idea is fine, but the execution is lacking. That light blue empty background is hardly dramatic. The individual figures are tiny and without impact. And the central Flash figure is more comical than anything else. This one’s just bad. As opposed to most issues of FLASH, this one contained a full-length story, with no Green Lantern back-up. That wasn’t a great surprise to me, as the Emerald Crusader now had his own series with Green Arrow. 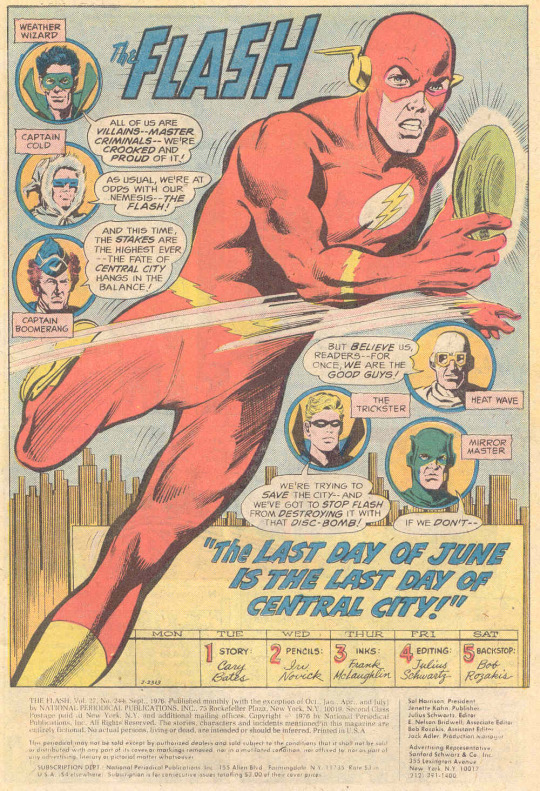 We pick up where we left off last time: the Top is dead, but in his final days he planted a series of bombs around Central City that will detonate in a week, destroying the City unless his fellow Rogue’s Gallery members can recover and deactivate them–a task that will pit them against the Flash, who has always beaten them. So the future relies on these criminals at last putting one over on their arch-enemy, not once but six times. Barry and Iris Allen attend a somber funeral for the fallen Roscoe Dillon when word comes in that Captain Boomerang is in the midst of a robbery. 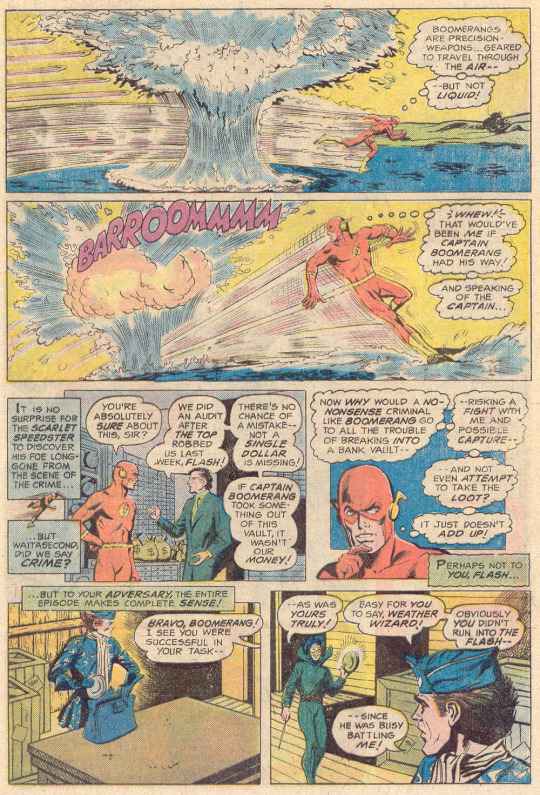 Barry becomes the Flash and chases down his foe, but Boomerang is prepared and is able to divert the Scarlet Speedster with a barrage of deadly boomerangs long enough to get away. Following up, the Flash learns that, like the Top before him, Captain Boomerang didn’t actually steal anything from the place he hit as far as they can tell. So the Flash is perplexed by this. Returning to the Rogues’ hideout, Captain Boomerang rendezvous with Heat Wave and Weather Wizard, who have similarly been successful in carrying out their own missions, giving them three of the six explosive devices. 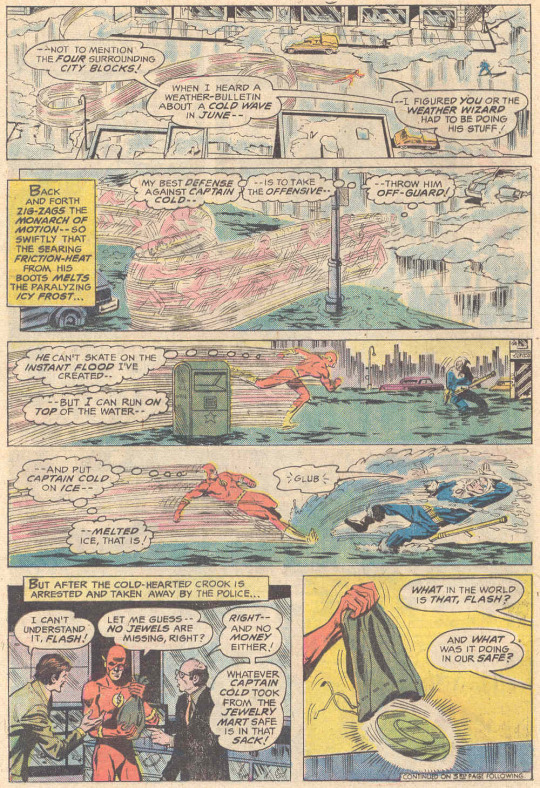 Shortly thereafter, Captain Cold makes his own run at his prize, but the Flash intervenes and handily defeats the Rogue, recovering the fourth of the explosives. Despite all of the tests that Barry can run on it, he can’t work out what it is or what it does. The frustrated Rogues now realize that they’re going to need to infiltrate Police Headquarters and retrieve the fourth explosive, and it’s the Weather Wizard who takes on this challenge. In the meantime, Barry and Iris have dinner and she talks about how she’s gotten access to all of Dillon’s materials for a story she’s doing for Picture News. Among those documents, Barry finds diagrams of the bombs, and puts the whole plot together. This also means that he knows where the sixth target is going to be, as the Trickster has obtained the fifth explosive and the Weather Wizard has recovered the fourth. But as the Rogues are re-creating the Top’s final crime wave, the final target is obvious. 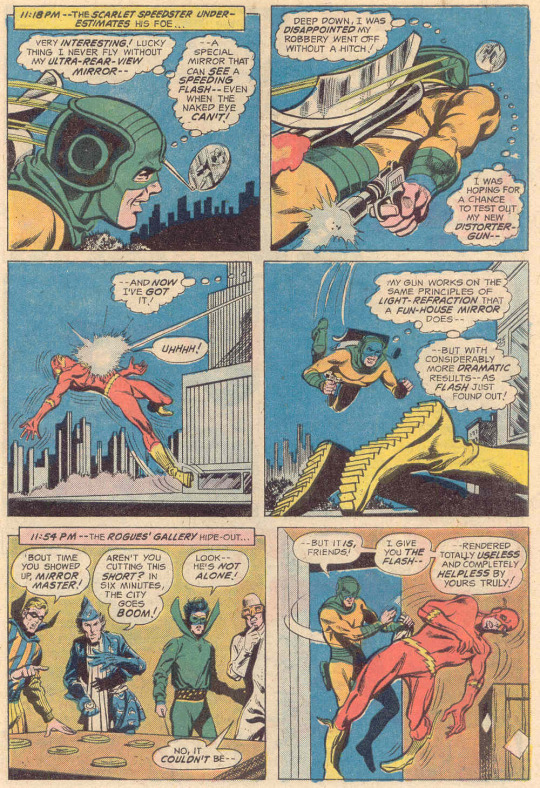 And so, knowing that the Rogues are trying to save the city, Flash runs interference as Mirror Master swipes the final device. He doesn’t bother to tell anybody what’s going on, as that would be too easy. Instead, he takes guns out of the cops’ hands and so forth so that Mirror Master won’t tumble to what’s going on. But Sam Scudder isn’t that oblivious, spotting the Flash’s activity in a rear-view mirror, and he takes advantage of the situation to blast the Flash with a mirror-weapon that scrambles the speedster’s molecules. 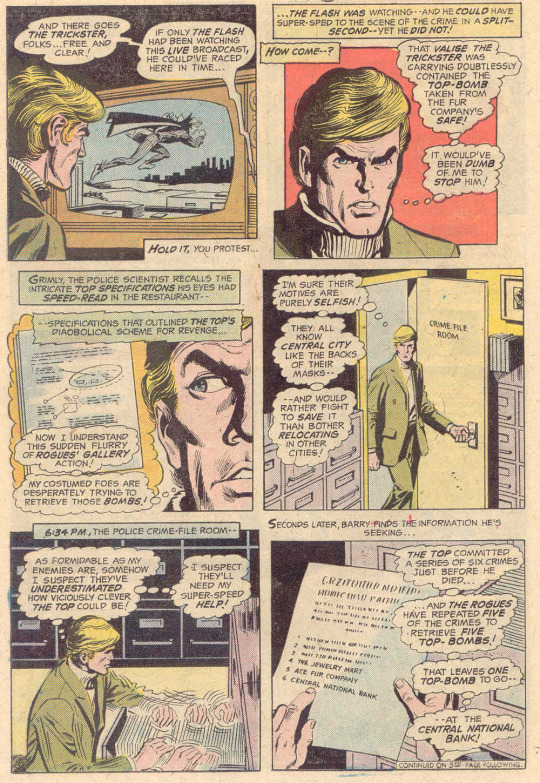 Mirror Master brings the defeated Flash back to the Rogues’ headquarters so as to lord it over them as they stack the six bombs to deactivate them–only to learn that the Top has one twist left: the bombs need to be stacked in a particular order to be deactivated, and now that they’ve been stacked once, they’ll detonate in sixty second. 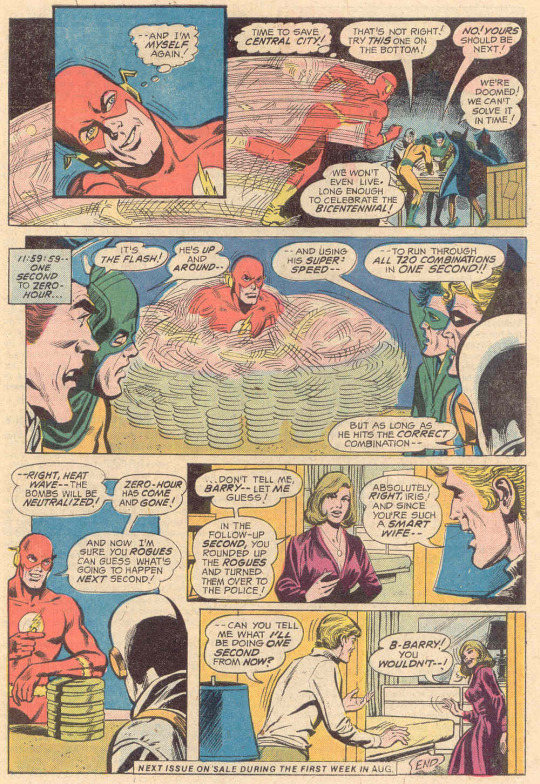 It’s a simple challenge for the Flash, though, whose complete control of his molecules allows him to shrug off the effects of the Mirror Master’s weapon and runs through all 720 possible combinations of the bomb-stack in an instant. And as thanks for all their good efforts in saving the city, Flash off-handedly rounds the other Rogues up and turns them over to the cops for stealing bombs that didn’t even belong to the places they were stolen from, then returns home for suburban fun with Iris.